ViewPointsoftware provides an abundant collection of features that can be used to create and customize a kiosk to your needs. ViewPoint kiosks feature smooth, intuitive touch controls that provide instant feedback and easy navigation, resulting in a powerful user experience. ViewPoint can play in either landscape or portrait orientation. ViewPoint is optimized to run on large touchscreens, although it is able to run on almost any display size and still maintain visual appeal, ease-of-use and high performance. ViewPoint can be branded to your company's look. The ViewPoint editor provides easy-to-use templates for fast content design, and also allows for deep customization of a design when required. Your content can appear on a coverflow of tiles. Tapping tiles takes you to another level of content. When a kiosk is not being used, it has an "idle" time slideshow of video, images and text. This provides a digital sign in your facility and also invites customers to walk over and start interacting. ViewPoint ViewBuild feature allows customers to customize a product, such as an auto, or try out combinations of products, such as furniture. ViewPoint ViewPick feature enables customers to search a set of products in a unique, visual way. ViewPoint kiosks can be customized to provide real-time access to inventory, staffing and other systems that help you connect with customers. Inventory includes search, sort, and filter. 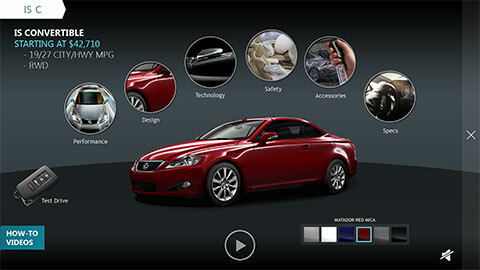 Our fun, visually appealing games can be customized to showcase your brand identity. Your branded dashboard provides an opportunity to communicate with your customers and provide useful information like weather and news. Viewpoint can seamlessly integrate real-time information from webpages. ViewPoint can receive RSS feeds. ViewPoint can play multiple videos on the same screen at once, with no delay. ViewPoint can send or receive data from many existing retail management software systems. ViewPoint can integrate with check-in systems or just email to notify staff of a customer arrival. ViewPoint provides an option for customers to take action instantly by sending a message via email to a sales associate. You can create your own surveys to collect customer opinions. ViewPoint has a user feedback popup that queries the user for a quick rating of their experience. Video, image and text assets are stored locally for lightning-fast loading and play capabilities. ViewPoint setup wizard can help you setup ViewPoint on your own hardware. ViewPoint software tracks and analyzes user behavior—showing what people looked at, where they spent the most time, how they moved through the system and more. ViewPoint also provides reports about user behavior and supports exporting data for additional analysis. A ViewPoint can be viewed on the web, using it as a preview of a kiosk, or as a web content. ViewPoint collects contact information and allows you to export contacts and/or integration with CRM systems. Software updates, as well as new and updated product information, can be updated remotely and automatically, helping you keep your site fresh and accurate. Videos, images and text can be updated remotely or through our content management tools.